I’m not sure there’s anything easier to do at home than to make fermented vegetables. Historically, in the days before refrigerators and freezers, fermenting vegetables was a common practice. Families would put their fermented vegetables in root cellars where they would stay preserved for long periods. 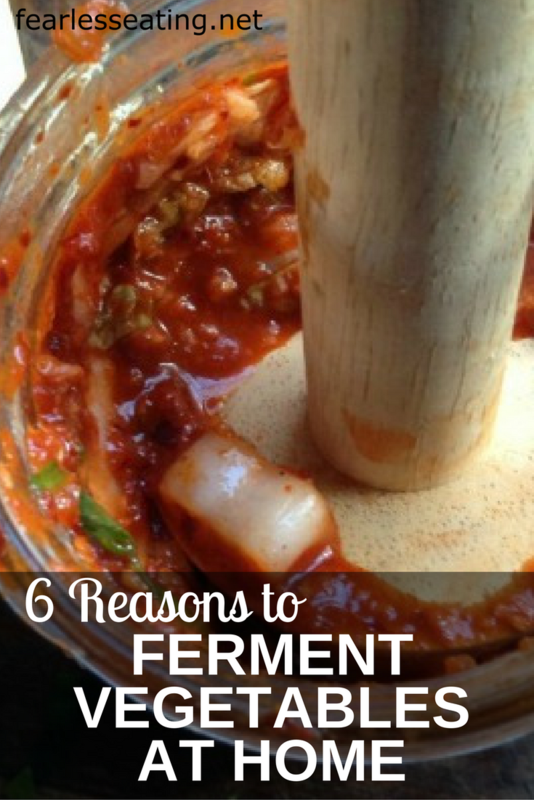 Fermentation is a natural preservation process but one that few people do on their own anymore. These days most people purchase fermented vegetables in supermarkets. However, the majority of products are not fermented properly. 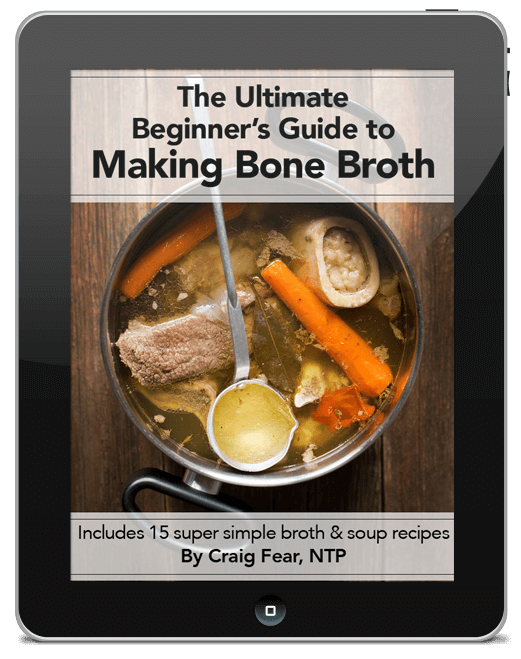 Proper fermentation uses only two ingredients – salt and water. A salty brine is the medium that allows vegetables to ferment properly. 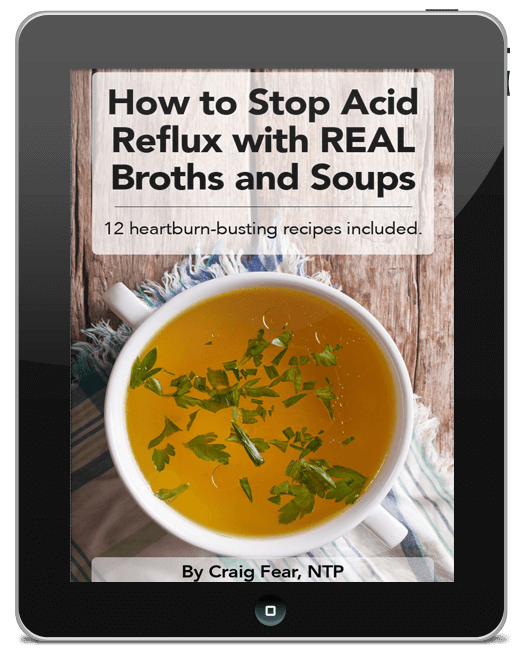 In that salty brine natural bacteria do their natural thing, which is to consume the naturally occurring sugars and starches. Lactic acid forms in the process, thereby souring and preserving the veggies. The salty brine also prevents bad bacteria from growing. The whole process takes anywhere from a few days up to a week at room temperature after which cold storage slows the process. Fermented foods will continue to ferment in your refrigerator and the taste and nutrient profile will change over time but they will last for many months. However, most companies do not honor this natural process. Instead, they pasteurized the vegetables, and add sugar, vinegar and other preservatives to lengthen the shelf life. While this is good for the bottom line, it’s not good for you. That process kills the naturally occurring bacteria which is the point of consuming them in the first place! Properly fermented foods are ALIVE, teeming with the beneficial bacteria that populate our digestive tract and play so many vital roles in keeping us healthy. Vlasic pickles may taste good (god how I loved them as a kid) but they’re essentially a dead food as are so many conventionally prepared fermented foods. I hear this all the time. No, I promise you won’t sicken yourself. 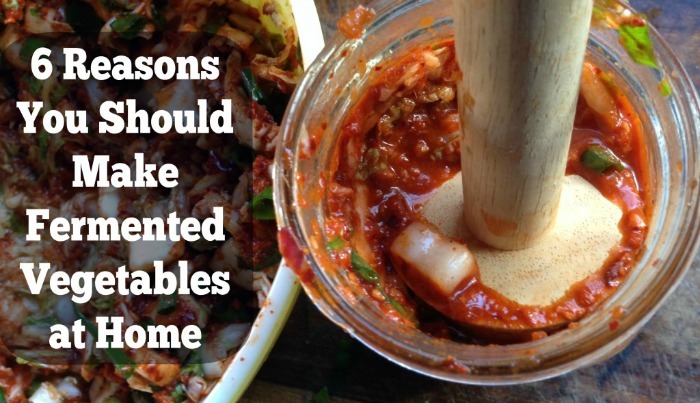 Many people are hesitant to make fermented vegetables at home because the notion of leaving food out is so foreign to them that they’re convinced they’ll be the first person in history to kill themselves. He goes on to say that there are no documented cases of food-borne illness from fermented vegetables. Little kids will LOVE watching your home fermentation projects. Look at it as a little science experiment in your kitchen. Even if it’s your first time doing it, convey a sense of enthusiasm and mystery to the process. Their natural sense of wonder and curiosity will be fun to observe as the veggies to start to bubble, fizz and ferment away. It will also be fun to watch their expression as you taste the vegetables every day to make sure they’re ready. This is also a good idea so that you can get your kids acquainted with the flavor of fermented foods at a young age. Picky eaters who want nothing but sugar and junk food is a difficult habit to turn around! The pleasant, sour flavor of fermented foods is a natural part of our taste buds. But because we don’t eat them anymore, many people find them unpalatable if not downright gross. Start your kids out young so they can develop a natural craving for them. When I got into traditional foods, I admit, I was a bit intimidated. Intellectually, I understood it all just fine. But I did not grow up on a farm. We ate out of boxes and cans and pretty much all those standard American processed food products. In time, I learned how to make my own stocks, render my own lard, make my own mayo, dressings and so forth. But I started with fermented vegetables and I’m glad I did because it helped me gain confidence with those other things. And it’s just so darn easy! Of all the things I do in my kitchen, my favorite is to make fermented vegetables. It never ceases to amaze me how I can take these somewhat bitter, unappetizing vegetables and transform them into something unbelievable delicious. And that’s part of of the mystery and fun! 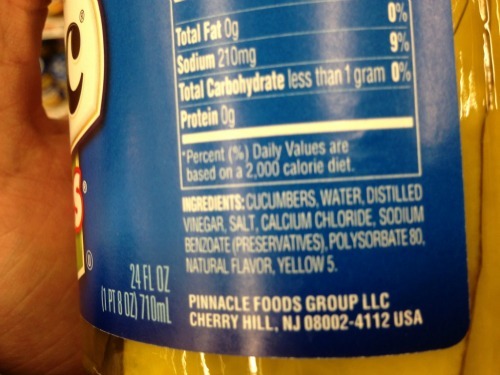 Conventionally “fermented” veggies in stores like Vlasic pickles need to re-create the same flavor over and over. See where it say “natural flavor?” Essentially that means artificial flavors. Those are the secret chemicals they use to re-create the same flavor over and over. You’ll see “natural flavors” in tons of processed foods. As an aside, how’s about some polysorbate 80 and yellow 5 with your burger? Those are artificial colorings they add to make the product look more appetizing. But real fermentation involves complex ecosystems of billions of bacteria. The amount of salt you add and the temperature in your kitchen are just some of the factors that will slightly alter how the fermentation proceeds, which also alters the final flavor. And of course, the flavor changes over time. You’ll notice profound differences in taste after a week, a month, two months and so on. This is normal and a sign that you’re doing things correctly! But you’ll be shelling out anywhere from $5 -$8 per jar for a good quality product. Not that expensive but it adds up over time. If you’re on a budget, fermenting your own vegetables is a great way to save some cash. From a large head of cabbage I can make two 12 ounce jars of sauerkraut which works out to about $1-$2 per jar. That’s pretty economical! Fermented foods should be an essential part of any digestive healing protocol. Of course, you can’t just have a serving of sauerkraut and expect 10 years of irritable bowel syndrome (IBS) to disappear overnight. But learning how to do it at home is a good first step. And that’s why I teach people how to do it in my online digestive health program. Class members learn how to make sauerkraut, kimchi, pickles, beet kvass and yogurt and kefir. All simple things that can be prepared in a matter of minutes in your own kitchen. Beyond fermented vegetables I also teach class members how to get at the root of their digestive problems with other traditional foods as well such as bone stocks, properly prepared dairy, grains and fats. 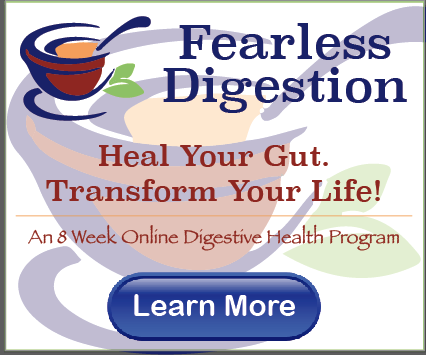 Click here to learn more about Fearless Digestion: Heal Your Gut. Transform Your Life! 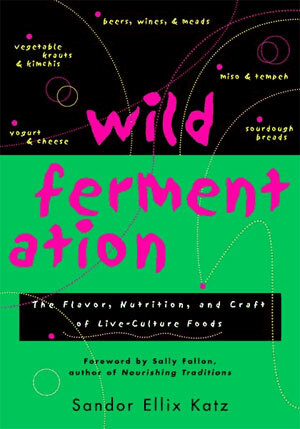 Click here to see Wild fermentation by Sandor Katz on Amazon. 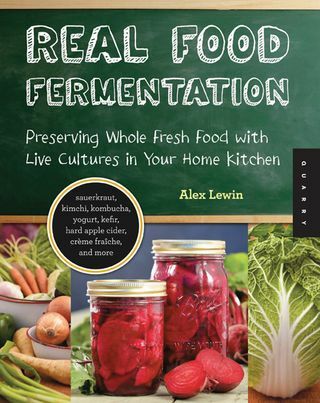 Click here to see Real Food Fermentation by Alex Lewin on Amazon. What the Heck is Beet Kvass? by Oh Lardy!